Choice Remarks: Students assigned to lobby legislators? The generally fawning coverage of the Oklahoma teacher strike often fails to address some questionable practices, including apparent attempts by some teachers to dictate opinions to students. 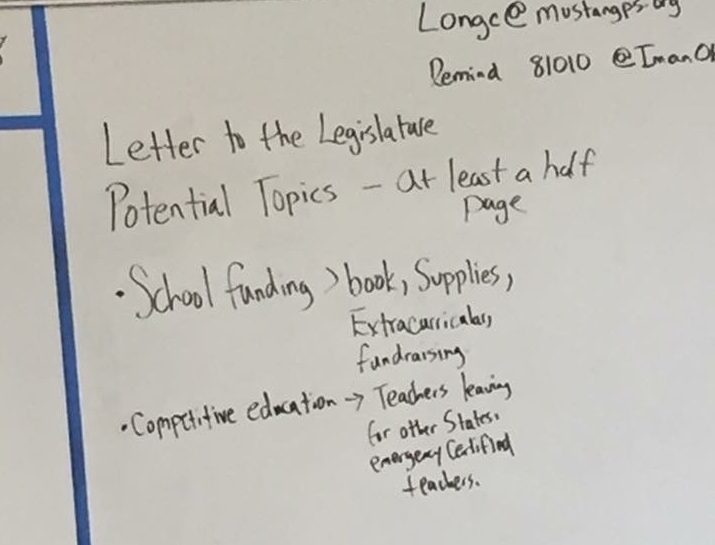 The mother of a Mustang High School student told OCPA that her son’s class, instructed by the high school soccer coach, was given a graded assignment to write letters to legislators supporting the strike. 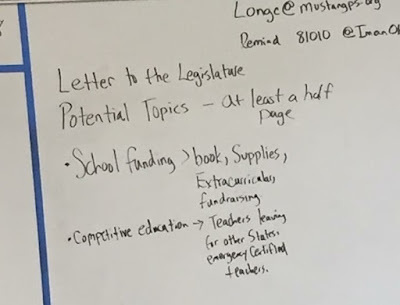 After asking that her son not be identified by name in fear of possible retaliation, she forwarded a photo of the assignment written on the classroom board calling on students to pen letters demanding more school funding or addressing “competitive education” issues, including teachers leaving Oklahoma for higher pay and the use of teachers granted emergency certification. Students were apparently not given any other opinions to explore. “It’s fine to give an assignment to write to a legislator, but not to tell them what to say,” the mother said. She said the teacher gave the class the assignment and immediately left to join the strike. A call last week seeking comment from Mustang superintendent Sean McDaniel was not returned. A call today yielded a recording that school is closed.